The announcement that Stephen King's Dark Tower series was coming to both movies and television was all the impetus I needed to finally jump into reading this series. The entire series of books encompasses seven novels, with the first being written in the early 70's and the next not coming until almost a decade later. In the preface to The Gunslinger, King notes that it was upon reading Tolkien's Lord of the Rings that the seed of the idea for his own epic fantasy was planted. But it wasn't until later viewing a certain western featuring one of America's greatest living actors (the movie being The Good, The Bad, and The Ugly, starring Clint Eastwood) that the light bulb went off in King's head. 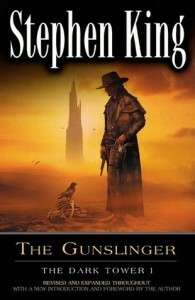 The Gunslinger is very much a melding of Tolkien's epic scope, Eastwood's gritty, gunslinger persona, and, without a doubt, King's own unique writing style. The plot is fairly straightforward: Roland, the last of the Gunslingers, is pursuing an ominous villain known only as The Man In Black. Roland follows in the latter's footsteps across a wasteland dotted only by the vestiges of our own modern society, for the world has "moved on". The modernisms we know so well have been swept away; by war, disease, or some other means, King never says. But the world depicted in this first novel is harsh, desolate, and unforgiving. With only the occasional flashback into Roland's past, The Gunslinger follows a fairly straight course as Roland does whatever he needs to do to capture and kill The Man In Black. 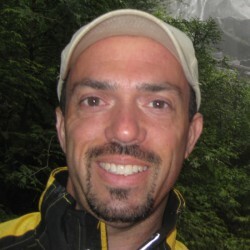 Even still, the glimpses into Roland's persona offer a glimpse into a very complex individual. He's a man driven by things we may not fully understand yet, but we see him as sympathetic nonetheless. We may not understand or condone his willingness to sacrifice anyone or anything to capture his enemy, but we also realize that, hell or high water, he is going to capture him. King admits he didn't know what direction the series was going to take past The Gunslinger. He knew Roland was on a quest to find the Dark Tower, but King didn't know the why's of it or even if Roland would ever actually find it. Needless to say, the reader is left with more questions then answers, which might be the best way to leave the first novel in a series of seven.